The kids arrived Saturday around 5:30, so we got to visit with them a little bit before they headed on down state to Grandma Mary's. At 8 months, I thought he might be afraid of us, but he wasn't. I took him immediately to see the duck at the pond near Brandon's front door. 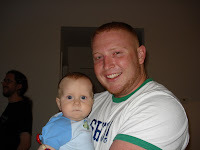 He is curious about all things and especially Uncle Brandon's red beard! Hah. He kept feeling Brandon's face with his little hand. 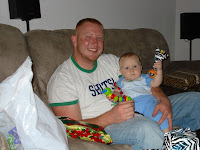 There must be something about the red hair, because his Daddy has a beard too. 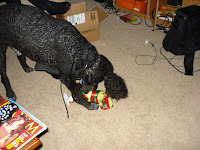 We each passed him around and let him unwrap some presents. I had sent his Christmas stuff earlier since they were going on a trip, but I had to have SOMETHING for him to unwrap, so I got him a couple rattles. . . things he could use in the car. He is becoming more vocal and likes things that make noise. . . what baby doesn't? 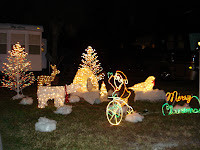 Today we are headed down to Lake Worth to see them at Grandma Mary's where we will have Christmas dinner. She graciously invited us down to be with the kids on Ronan's first Christmas. The house hunt continues. Yesterday we kidnapped Brandon and dragged him around for hours looking at 23 houses on our new list. We have quit looking in Palm Bay and are concentrating our search on Melbourne. The neighborhoods are much better and don't seem to have the water problems they have in Palm Bay. The Pace household wants to wish each and every one of you a Merry Christmas and a Happy New Year. Well, that about sums it up! That's all we've done since we got here, besides a little Christmas shopping for each other. We already went to the bank and Brandon is pre-approved for a loan. That was easy. All those lectures about saving/spending money with a goal seemed to have worked. We have been searching on the internet for houses in specific areas with his required features. Then we print out the data sheets, color code them, then Terry plots them on his Delorme Street Atlas program and we print out the maps. Then we plan our route and do drive-bys. Many we have elminated that way. Once the weekend gets here, Brandon will go with us and we will show him ones we think are "worthy" of visiting in person. It seems to be working this way, but man, oh man, am I tired of it already. So today, I will be calling a real estate agent and telling her what we are looking for and give her a couple we would like to go through. Things are really quiet here in Enchanted Lakes. A lot of people here work, so they are gone every day. Not a lot of mixing around like you get in our park in Texas. They do have activities here, but we are pretty busy at the moment. They are some really pretty Christmas decorations which I will have to get pictures of and post, so check back later tonight or tomorrow. Daughter Jocelyn, hubby Tom and grandson Ronan and grand-dog Jericho are headed down here today from Virginia. They are going to Lake Worth, about 2 hours south to spend Christmas with Grandma Mary, Tom's grandmother. I have never met her, so we are going down for Christmas dinner. Well, must get ready to take off again, so take care. We are here in Malabar, Florida, at Enchanted Lakes, our home for the next month. We met our son last night. He brought 3 of his friends and we had a cookout. We had a lot of fun before they took off for some nightlife. Ours consisted of an early bedtime after having been on the road for 4 days. We arrived and got settled in just before the storm we were supposed to have. Fortunately, we didn't have much down here. It is quite breezy out there, but having been in Texas for 5 weeks, we are conditioned to that. It is wet out there as well today, but not raining hard. There was a warm front colliding with a cool front last night that was supposed to give us some nasty weather followed by a cool down, but it is still "shorts" weather outside. Hopefully that will continue. I guess we were ahead of the weather front as we made our way down here yesterday as there was some tornadic activity around the panhandle after we came through. Glad we were in front of it. It would catch up with us at night as we came across Texas, but we got ahead of it once we started heading east on I-10. Fortunately the drive was uneventful. I was driving on Friday when an 18-wheeler was passing me. His nose was almost even with mine when I heard what sounded like a gunshot. I am always wary about running along side of trucks due to blowouts. I had just started to glance in my side-view mirror when I heard the pop and looked at the precise time the tire on the rear of his trailer exploded. Fortunately the rear of his trailer was just behind the SportTrac, so when the tire blew, it actually flew out behind the little truck. Whew. I pulled over as far as I dared in my lane and picked up my speed as the trucker was instantly aware of what happened and eventually reduced his speed and pulled over when I was clear. Fortunately he only slightly wobbled with the trailer, so all was well. That is how I hoped it would all happen. A front tire would have been another story. We had some interesting experiences with campgrounds. In Biloxi, Mississippi, there is still very little left of what was once a great visual experience. Most of the old stately homes along the coast are gone, some rebuilding is being done, but a lot of ocean front land is for sale, the owners not planning on rebuilding. That is really sad. There are very few campgrounds, but we found one . . . Fox RV "resort." Hah. That's a laugh. It's a FEMA village. Over 100 sites, but most are still taken up with FEMA trailers. Sites were too short to park our 40'er plus our truck. But we couldn't use the receptacle on our site because it was hanging out of the box, so we plugged into the one that was directly behind ours and parked our truck behind us. So we took up two sites, but they couldn't use one anyway. The pool was no longer used, the liner hanging off the sides down into the pool. The park was not trashy, but some of the units in there for the long term were. I think once people surrendered their FEMA trailers, they went out and purchased old run-down travel trailers and parked them in there. We did a driving tour of Biloxi. We had been there 20 or so years ago with the kids, and very little is recognizable. They have done a tremendous amount of cleanup. Having seen other hurricane devastated areas, it was clear that in the two years since the hurricanes hit, they have cleared a good part of the rubble away. The beaches are gorgeous, but there was no one on them. Not many people/tourists. Several casinos are built. I suppose those draw more tourists and money than most businesses. We couldn't find any remains of the campground where we had stayed years ago. It may have been gone long before the hurricanes, however. We passed by Bouvier, Jefferson Davis' home. In fact, our campground was directly behind it. What a state that was in. It was ravaged by the hurricanes, but is being lovingly restored. I think the library was totally lost, but the main house is there and they were working on it. We toured that when we were here before. Friday night we pulled into the Madison Campground. Don't bother ever stopping here. It is a former KOA and at one time would have been a beautiful campground. The pool was overgrown as was the tennis court, the miniature golf, the campground itself, etc. The building was in disarray from years of neglect, eaves falling down, etc. We were the only overnighters, but there were permanent sites rented. Some of the electrical boxes had been knocked over, there was no maintenance. The campground was adjacent to the Deerwood Motel which looked to be in very good shape. It is a combination motel/campground. It is sad to see what used to be a really nice campground being so totally neglected. However, our electric did work and we got a good night's sleep. Not sure what we are doing today. Brandon wanted to bring his motorcycle over and work on some lighting, but it is raining and windy, so that will have to wait. I'm sure, however, that adventure awaits! Head 'em up, move 'em out. . .
Today we roll. Headed for Florida to see son , Brandon, and hopefully help him find a new home. He has been in Florida for 4 years. He has changed jobs and decided to stay right where he is at. Melbourne is a beautiful place and unlike a lot of Florida. They have had some hurricane winds in recent years, but nothing like other parts of the state. He is close enough to the ocean to always have a breeze, so few bugs and moderate temperatures. We are excited for him and anxious to help him find a place. We also will be seeing our grandson, Ronan, who will be with his Mom and Dad, our daughter and son-in-law, Jocelyn and Tom. Tom's grandmother Mary lives about two hours from Brandon and we have all been invited for Christmas dinner, so we are going. Ronan is seven months old, so this will be a first. Also, it has been years since our children have been together with us for the holidays, since one lives in Florida and one in Virginia and we lived in Indiana. Fortunately, our lifestyle permits us the luxury of traveling to see our children. Otherwise, our visits would be much fewer. Jocelyn did manage to get Ronan to sit still for Santa, but he wasn't too happy about it. Hah. We sure hate to leave the RGV. The doctors have decided not to do surgery on Dad. He has a few things that complicate what they wanted to do and since the aneurysm is not at the point where it must be repaired, they are not going to do anything except monitor it. So, we have decided to move on to the next adventure. We did take Mom and Dad out to Hidalgo to see the city lights. 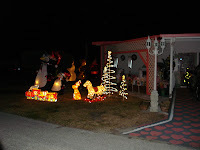 The entire town gets involved in light displays and every park and many houses and city buildings are lit up. I thought we saw everything there was to see there. However, many of our RV.netter friends have taken the horse-drawn carriage tours and the tour guides give a history of the town along with the light viewing. I think next year we will take Mom and Dad there for the tour. The lights were beautiful and always enjoyable. They add more displays every year. We will miss what is becoming the weekly RV.net gathering at the Horseman Grill and Saloon to see our favorites, 12-string Tim and Sharon. I'm sure our friends will manage to keep the gathering going and we will be back next year to enjoy the music once again. So, we are on the road at 8 a.m. today. Hope the wind is at our backs today! Stay safe, friends and family, and I'll post again on down the road. 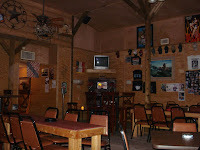 The Horseman's Saloon and Grill in Weslaco, Texas. What a great place. 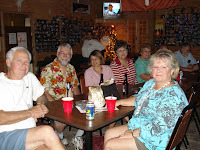 We joined about 20 other RV.netters last night around 4 because that is when the entertainment starts. Twelve-string Tim and Sharon. What a duo! And what a hoot! They played for 4 hours, taking only 2 short breaks. The bar looks like a barn and inside there is a bar, tables and chairs, a dance floor and a stage. Inside we waited for most of the rest of our group before ordering. Then at 4, Tim and Sharon started their show. 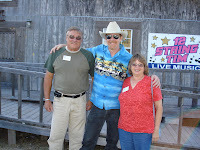 What a great time and great entertainers. Tim plays twelve-string guitar and Sharon accompanies on a synthesizer. 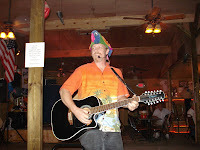 In their repertoire, they must have thousands of songs including, pop, oldies, ballads, rock, parrothead songs, etc. They have something for everyone. 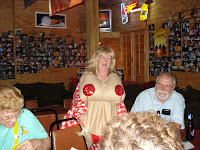 And along with the songs, Sharon dresses in character and engages the audience in lively participation. They take requests from the audience and they played all our favorites, which included the Winter Texan Song. In fact, there is a sign hanging up that says, "Welcome Back, Winter Texans." Thanks 12-string Tim and Sharon for a great evening and exceptional entertainment. We plan on going back. Our only regret was that The Texan himself wasn't with us, having pulled out for Mexico earlier in the week. Oh well, there is always next year! Now to bring you up to date on other matters. We haven't left the Valley yet and not quite sure when we will. My Dad has an aneurysm that needs to be repaired. It is not an emergency and we aren't sure when they will do the surgery. We are awaiting some new test results as it looks like they will be putting stents in the leg arteries as well. So we are waiting, waiting, waiting, on the medical community to let us know when this will happen. If it is before Christmas, we will stay and wait and make sure all is well before heading out. If they wait to do it after Christmas (and we will know by the 12th), we will go to Florida for the holidays with the kids, then come back to Texas. In the meantime, we are just enjoying the fantastic weather of the RGV, the Rio Grande Valley. Warm, hot days, and cool nights. Just about perfect in my book. I have won $10 each of the last 2 weeks at Bingo! If I wasn't already retired, I would be tempted to quit work and just play Bingo. There is a game every night in one of the parks. I have finished up the inside shades for the motorhome front windshield. They really cut down on heat transferrence.